Choosing fat-free snacks can greatly reduce your total daily calorie intake, which is beneficial when you're trying to shed pounds. Whether you're purchasing items from the store or preparing your own recipes at home, a variety of fat-free snacks are available to choose from. Curbing your sweet tooth doesn't mean you have to indulge in high-fat, high-calorie foods that pack on pounds quickly. Instead, choose from a variety of fat-free sweet treats. If you're looking for a quick burst of energy from a convenient snack you can take with you on the go, raisins definitely fit the bill. This nutrient-dense snack is perfect for kids and athletes. Sun-Maid raisins provide you with about 130 calories in each ¼-cup portion. If you're a chocolate lover trying to curb your sweet tooth without the extra calories, look no further than fat-free chocolate fudge pudding. This sweet treat contains just 40 calories per serving, 1 gram of fiber, and absolutely no dietary fat. 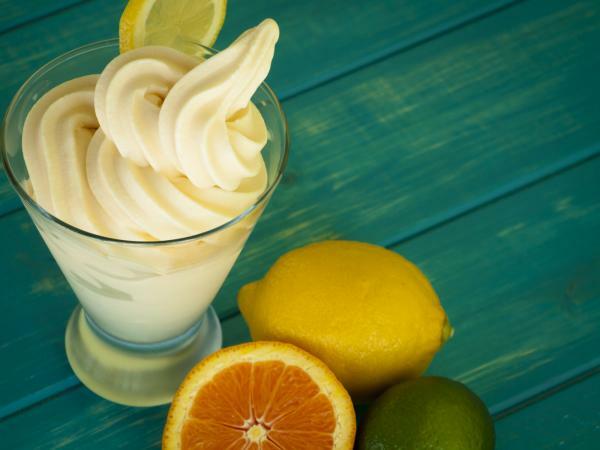 Frozen yogurt (or ice cream) made with fat-free milk is another favorite dessert for people trying to cut fat and extra calories. Choose brands made with low-calorie sweetener, which will provide you with about 90 calories in each ½-cup portion. Make your own homemade fat-free fruit leather with just three simple ingredients: pureed fruit, lemon juice, and honey or agave. Or, simply purchase ready-made fruit leather bars (available in a variety of flavors) containing just 45 calories per bar. Choosing raw fruit helps curb your sweet tooth and adds extra fiber and vitamins to your meal plan. Choose apple slices, minted melon balls, a banana, berries, or citrus fruits instead of higher-fat sweet treats. One cup of raw fruit provides you with just 40 to 140 calories per cup, depending on which type of fruit you choose. Containing just 80 calories per serving, fruit-flavored gelatin is the perfect treat to curb your sweet tooth without the extra fat. To liven up this delicious snack, add mandarin oranges, canned peaches, or pears. It's important to check the nutrition facts label on popsicles, as not all are fat-free. But unless the popsicle is made with milk, ice cream, or coconut, chances are pretty good they are free from dietary fat. Cut calories by choosing fat-free, sugar-free popsicles, which contain just 10 to 15 calories per serving. Or, make your own popsicles by adding blended fruit to water, and place it in ice cube trays or popsicle molds in the freezer. Skip the greasy, high-calorie chips by choosing lower-calorie, fat-free alternatives when you're in the mood for salty snacks. If you want to satisfy your salt craving, try fat-free homemade kale chips. These nutrient-rich chips are easy to make in a food dehydrator; simply add spices of your choice (such as paprika, salt, pepper, or onion). These veggie chips provide just 30 calories in each 1-cup portion. If you're seeking the perfect, fat-free, salty snack that'll keep you full for hours, try Synder's sourdough hard pretzels. This carb-rich snack provides you with 100 calories in each serving of one large pretzel. Pair it with fat-free cheese, fat-free sour cream, fruit, or raw veggie slices to keep the snack free from fat. Many popcorn brands do contain fat, but it's because corn kernels are often popped in oil or butter -- or have extra butter added after popping. But popping your own plain popcorn provides you with a delicious fat-free snack. Add salt, if desired. 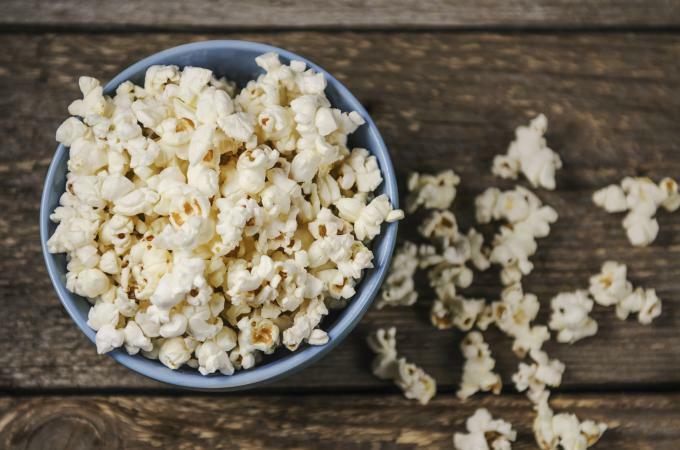 A 1-cup portion of air-popped popcorn contains just 30 calories. Making homemade corn chips means eating fewer calories than regular chips and requires just a few ingredients. You can make them from scratch with corn flour, as well. Simply mix pureed corn with flour and salt (or other seasonings) together and place in a food dehydrator for 6 to 8 hours. Adults and kids alike will love this tasty salty snack that provides just 6 calories per chip. Pair corn chips with fat-free salsa, if desired. These fat-free snacks are rich in protein, which aids in healthy weight management, boosts satiety, and helps you maintain lean muscle mass. Fat-free Greek yogurt makes the perfect fat-free snack, because it's an energy--and satiety--booster without the extra calories. This nutrient-dense, protein-rich snack is a good source of vitamin D and calcium, but contains just 80 calories per container. Not all types of cottage cheese are low in fat, but a variety of fat-free options are widely available at major grocery store chains. This calcium-rich snack contains 80 calories in each 1/2-cup portion and a whopping 13 grams of protein. 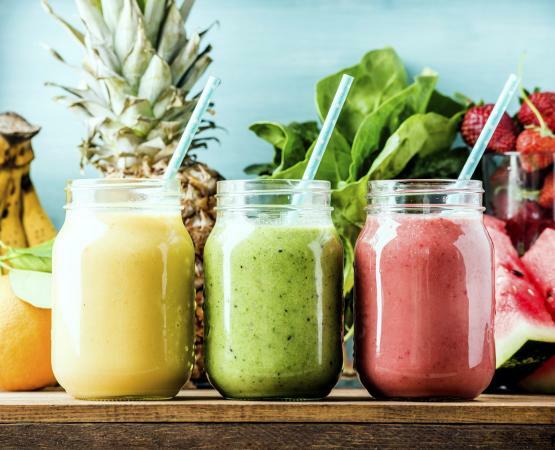 Making a fat-free whey protein smoothie is an excellent way to start your day off right, and it gives you a quick boost of energy. Blend 1 cup of water with 1 cup of frozen fruit of your choice and 1/3 cup of whey protein powder in a blender. This protein-rich treat provides you with just under 200 calories in each 2-cup portion, depending on which fruit and whey protein powder you pick. While cheese is generally not a low-fat food, fat-free cheeses are available. One serving of fat-free cheddar cheese provides you with just 44 calories and 9 grams of protein, making this calcium-rich protein food a winner for adults and kids alike. While not all jerky is fat free, choosing Krave turkey jerky--flavored with basil and citrus or lemon and garlic--is an excellent way to eliminate fat and cut calories. Each 1-ounce portion of protein-rich Krave turkey jerky contains about 90 calories, 9 grams of protein, and less than 1 gram fat. The yolks of eggs do contain dietary fat but choosing hard-boiled egg whites gives you an excellent source of high-quality protein without the extra fat and calories found in whole eggs. In fact, the egg white from one large egg provides you with almost 4 grams of protein, but just 17 calories. Sprinkle with salt, if desired. 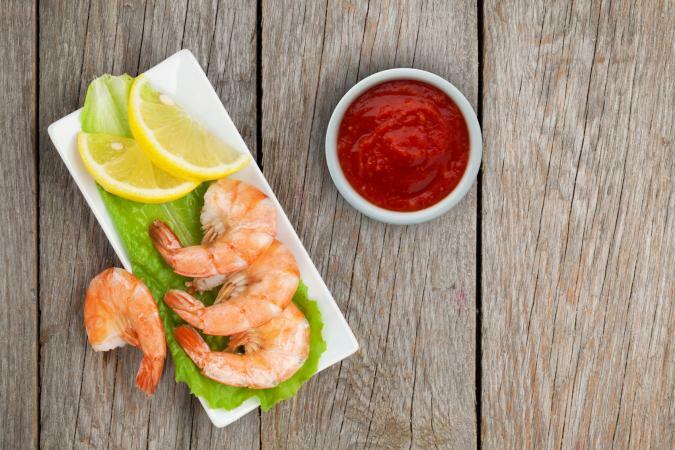 Snack on shrimp to boost your protein intake but avoid extra dietary fat. Each 3-ounce portion of shrimp provides you with 72 calories and 17 grams of protein, but under 1 gram of fat. Pair shrimp with fat-free cola jalapeno sauce or any other fat-free cocktail sauce, if desired. A few other fat-free snack options not classified as sweet, salty, or protein-rich make excellent additions to any meal plan. If you're seeking a less traditional fat-free snack that really fills you up, consider homemade honey whole-wheat bread. To make this recipe truly fat-free, avoid using oil. Instead, choose fat-free nonstick cooking spray for your bread pan to prevent the dough from sticking. This delicious snack generally provides 80 to 100 calories per slice. 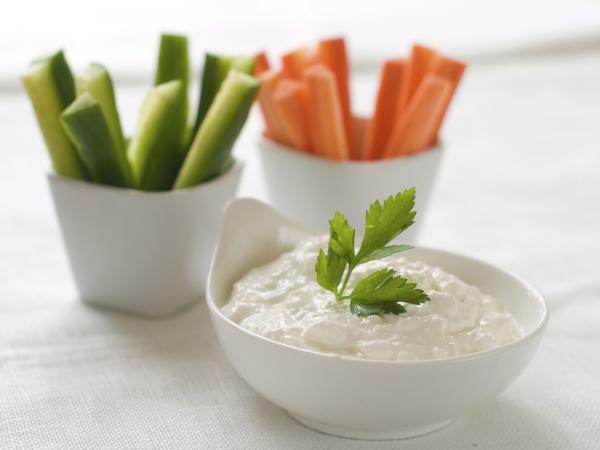 You don't need high-fat veggie dips to enjoy the delicious taste of raw veggies for a snack. Foods like raw tomatoes, cucumbers, peppers, mushrooms, carrots, and celery sticks, are fat-free, low in calories, and rich in fiber, vitamins, and minerals. Such veggies contain just 10 to 60 calories per cup, depending on which vegetable you choose. Pair raw fresh veggies with fat-free salad dressing or fat-free Greek yogurt, if desired. Choose Newman's Own fat-free fig Newmans when you're seeking a quick pick-me-up without fat or extra calories. Fig newtons are excellent sources of carbs and energy, and even 2 grams of protein. They provide just 100 calories per serving (two cookies). Your body does require dietary fat daily to function properly, but picking fat-free snacks is a great way to cut overall calories throughout the day, which comes in handy when weight loss is your goal. You'll never get tired of fat-free snacks with such as wide variety of delicious treats to choose from.